Suffering from a nasty cold or flu? Painkillers might not shorten the duration of your illness, but these friendly-neighborhood over-the-counter helpers will certainly make it easier to deal with. Lack of choice isn't a problem you'll face, as your pharmacist offers a whole host of different options. The most common ones are nonsteroidal anti-inflammatory drugs (NSAIDs) and acetaminophen — and nearly all OTC painkillers will contain one or the other. Pain relievers won’t get rid of your illness, but they can fight the aches and fever you'll be saddled with if you're suffering from a flu or cold. The majority of adults — those who don't suffer from certain medical conditions or take particular medications — can safely use over-the-counter painkillers like ibuprofen, Aspirin, acetaminophen, and naproxen. It is important, however, to follow the instructions on the package insert when taking any type of pain reliever. Don't take a higher dose than you should, because you want the painkiller to make you feel better, not mess your long-term health up. Taking too much ibuprofen can make your stomach bleed, for instance, while overdosing on acetaminophen is bad for your liver. To avoid complications, ask your pharmacist about the dose and which medications you can safely take together. Most people will be just fine if they stick to the recommended dose and don't take NSAIDs for more than a few weeks at a time. NSAIDs do, however, increase the danger of severe stomach bleeding. They might also raise your risk of a stroke or heart attack. You should contact your physician before taking NSAIDs if you have stomach issues like heartburn, heart disease, high blood pressure, kidney disease, or liver disease. Also, let them know if you have asthma. 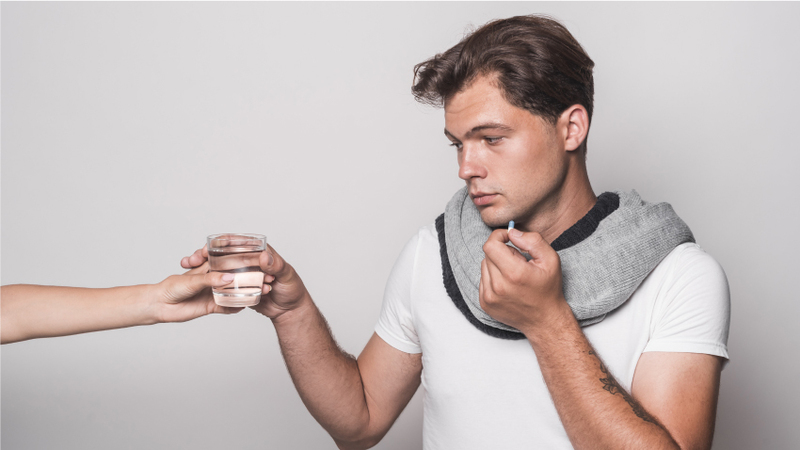 Don't use alcohol while taking NSAIDs — nonsteroidal anti-inflammatories plus three or more drinks (in men) or two or more drinks (in women) places you at risk of stomach bleeding, but abstaining from booze while taking NSAIDs is even better. Blood-thinning drugs alongside NSAIDs induce a similar risk, so talk to your doctor before using these drugs if you are in this situation. People who are over 60, have experienced stomach bleeding before, take steroid drugs, or use other NSAID drugs likewise have a higher risk of stomach bleeding. Acetaminophen, also called paracetamol and Tylenol, is a pretty effective OTC pain reliever and fever reducer. It’s usually used to ease mild to medium pain — making it suitable for conditions like toothaches, colds, fevers, muscle aches, arthritis, headache, and backache. Liver damage is the most common serious side effect of acetaminophen — and taking more than the recommended dose puts you at risk. This also means that people who already have liver disease, those with alcohol problems, or those who think binge drinking while taking acetaminophen is a good idea are in danger of damaging their livers (even further). If you use the blood-thinner warfarin (Coumadin), ask your doctor if you can use acetaminophen before you do. Make sure to read the instructions on the package thoroughly and don’t take more than you’re supposed to. Since lot of over-the-counter and prescription drugs have acetaminophen, sometimes labeled APAP, people who are taking more than one medication should pay attention to all the ingredients so they don’t take too much acetaminophen. How much acetaminophen can you have? You can safely take 1000 mg, or two 500 mg tablets, at a time. This is the standard dose. You shouldn't have more than 4000 mg a day. You should always wait at least four hours since your last dose before taking anymore. In children under 12, the dosage of paracetamol depends on their weight and age. The medication is available in syrup form for the littlest patients, and parents should talk to their doctor or pharmacist — or consult the package insert — to find out how much their child can safely take. Many people who use over-the-counter pain relievers are simultaneously taking other non-prescription and prescription drugs, like for menstrual symptoms, allergies, insomnia, and arthritis. If you're one of them, be aware that you shouldn't take two drugs that have the same pain reliever in them, because this could lead to an overdose. Not only should you avoid using two drugs that contain the same active ingredient, even combining different painkillers can be dangerous. Consult your doctor before doing this. We know most people don't pay that much attention to the package insert — the little paper — that comes with all medications, but you definitely should. It contains important info about the active ingredients, side effects, dosage, and how long you can safely take a drug for. Also keep track of the dosage you have taken and how many days you've been taking the OTC painkiller for. Stop using the drug when you feel better. You shouldn't give cold or cough drugs to kids younger than two years old. It’s dangerous to give Aspirin to kids younger than 18, because it can boost the risk of Reye’s syndrome, a rare but life-threatening disease. Don’t use a cooking spoon to measure out a dose of liquid medicine — that's what the measuring spoon that came with the drug is meant for. Make sure to put medicine high up where your kids can’t reach them. HUSBAND and I TRYING to CONCIEVE but I'm ADDICTED to LORTAB. 7wks preg and taking lortabs daily! !